My two favorite holsters both happen to be made by Galco, the Quick Slide and the Royal Guard. I guess I tend to pick up Galco holsters because they’re on the shelves of the gun shops where I do business. I like to look at holsters and try them with the gun before I buy them. Someday, I may get adventurous and try a Milt Sparks or a Wilson in shark skin, but for now, the Galcos meet my needs pretty well. The Galco Quick Slide is the most comfortable of the two. Mine is a deep cordovan color which looks good with my parkerized Kimber with its rosewood grips. The Quick Slide holds the gun close to your side, but not so close as to impede a quick draw. Since it rides outside the belt, it is very comfortable. It carries the gun just a little bit lower which again facilitates a natural draw. I tend to use the Quick Slide for IDPA matches because of its comfort and the way it draws. There are a couple of negatives to this holster. It doesn’t protect the gun very well since it only covers the area of the trigger and ejection port and up to a point just below the sight. You can bump into things with the gun when you’re wearing this holster. Since it hangs pretty low and is fully outside the pants, the only concealment that really works with it is a long jacket like a blazer or parka. The Royal Guard is a terrific concealment holster, especially for large, heavy autos such as 1911-pattern, the Beretta 92F, and their clones. It is an “inside-the-waistband” (IWB) style holster in natural horsehide. It has two belt loops with flat black snaps. 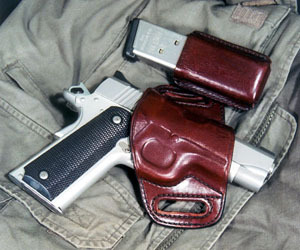 It has a reinforced collar which holds the holster open when the gun is drawn and does not collapse closed, making a one-handed re-holster possible. 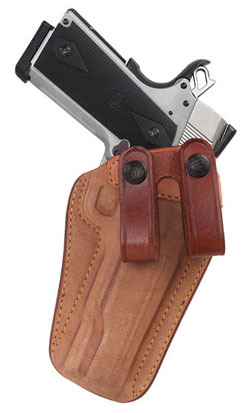 Since the holster rides under the belt, it holds the gun to your side very firmly. I think the IWB design supports the weight of a large gun better than most other styles since your belt supports it on one side and your body supports it on the other. This keeps the gun from leaning out away from your body the way that some pancake style holsters will do. With the IWB worn just behind the crest of your hip-bone, you could almost conceal the gun without a covering garment using only your arm ( I wouldn’t advise this, but that’s how well this style of holster holds the weapon). Since I like to wear short jackets and sweatshirts, this type of holster fulfills the concealment mission admirably without the problem of a muzzle peeking out from beneath a jacket or shirt tail. The negative of the Royal Guard is that it isn’t quite as comfortable as a holster which rides outside your belt, and if you have indulged in a bit too much turkey it can be a struggle to get on.